All images © David Sykes 2012 All rights reserved. This Festive season I decided it would be good to create a Christmas inspired shot that I could send out to the people I’ve worked with over the years, so I started to think up ideas and came to the conclusion that everyone loves festive food and presents at christmas so why not combine the two. 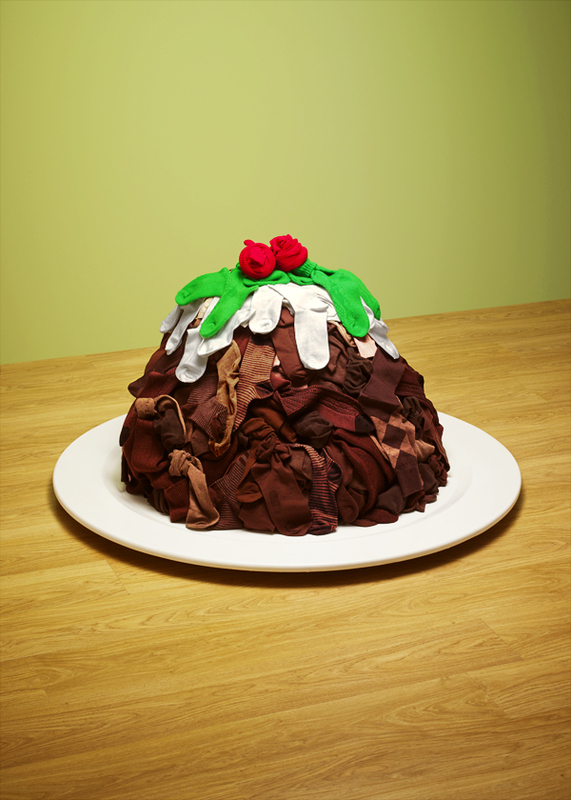 That is how I came to create my sock christmas pudding, for those that have followed my work over the years you’ll know that I have liked to create food images but not using food but everyday objects to create faux food. So I dusted off (and repainted) my giant 4 foot plate and went about creating my giant sock pudding, the pile ended up being 3 foot high and nearly 4 foot wide and Katie Cordell the stylist had to source over a hundred socks. It took us the best part of a day to create the perfect sock pile and at the end I was tempted to go for the flaming Christmas pud and set fire to them! But I couldn’t as I needed them for the next part of my mailer. I thought it would be fun to send people one sock from my pudding as a memento and as creative inspiration, I custom made some sock tags with a challenge on them to make the lonely sock into a festive stocking or christmas character. To help them on there way I supplied a starter kit of some fake fur some red and green felt, googly eyes and some buttons. (see below) I’m asking them to send pictures of the results so I’m looking forward to seeing the festive creations. This will probably be my last post of the year so I’d like to wish everyone a merry christmas and a happy new year thanks for following my blog.